Who gives a thought to their garlic press ? I do, and now you don't have to. No really, you can thank me later. Garlic is in virtually every recipe in the contemporary culinary oeuvre. Over the years I have vacillated between the smash and chop crew and the garlic press gang, never feeling strong enough to commit fully to either method. 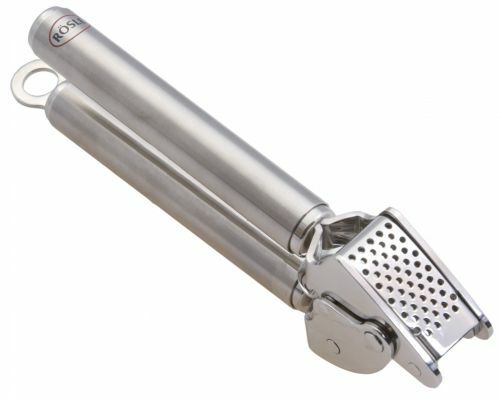 Every single garlic press I have ever owned has sucked in one way or another, frequently in more ways than one. They corroded, broke, were messy or inconvenient to clean and many just plain didn't work very well. So, I would smash and chop until overcome by the urge to get a new garlic press. Don't get me wrong, smashing and chopping is perfectly fine, but let's face it, unless you are making a bucket load of minced garlic, using an 8 inch chefs knife to mince three cloves of garlic is a PITA. But I digress, I have put all that behind me with my purchase of the stupid-expensive Rosle garlic press. What can I say, this thing just straight up works, load in the three cloves, squeeze, slice, rinse, boom - done.